Astronomy Lover: Smile of Night Sky! Special and funny "smile of night sky"! If you went out last night, about 18:00, you could see this gorgeous astromical phenomenon! The "left eye", which was the brightest star, is Venus. And, the "right eye", is Jupiter. But if you didn't see it at last night, you can't see it on today anymore. Because the planets will move, that is, today we will see that smile face become a face of "Bao Cing Tian "(who was the famous official in Sung Dynasty). We called that because the "curve lips"(Waxing Crescent moon) turn to a mark on the forehead, which Bao Cing Tian had it on his forehead. It has many information about astronomy inside, for example, special astronomical phenomena, activities and plenty knowledge about astronomy. If you want to get more about astronomy, it can helps you!! Awesome pictures! I saw the sky that night and thought I was looking at some kind of messege from above that tells us to cheer up! The stars were just too bright to be real. they were almost like light bulbs fixed on the night sky! 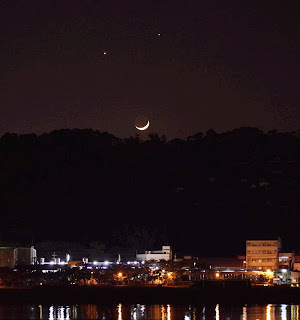 I'm glag to know that the two stars are actually Venus and Jupiter. Astronomy is really an interesting stuff! 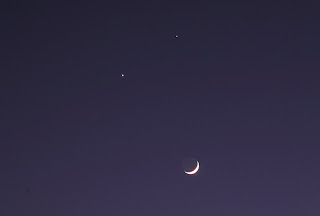 It’s such a pity that I missed the gorgeous astronomical phenomenon on the first day. I learned the information and saw the photos on the news repeated on many news channels. However, I did saw the "Bao Cing Tian " you mentioned on the second day, which was also cute. By looking up side down, it looked more like a sad face to me. Awesome pictures! I saw the sky that night too.It was amazing wasn't it ? Too bad that I know so little about photagraphy or else i would have taken the picture myself. How i'd wish one day I would be able to take such a amazing picture. It is really great to see you post a lot of astronomical phenomenon on this blog. I love to see you write more. Looking forward on your blog. nice pictures~when i saw it hanging in the sky, i was riding my bike on the way to 文院 practicing the dance & song for the grand drama!that beautiful star in the sky ease my tiring mood:) thanks for the picture sharing! The smile of the night is so amazing! I'm wondering is there a sad face of the night? Anyways, I would like to know more about special phenomenona of the moon. BTW, I want to be informed of the next meteor shower! So would you please keep an eye on the sky movement for me? The stars are really gorgeous aren't they? That's why I love astronomy so much!! We saw the sky together, did you remembered that? :) To me, astronomy is really the most interesting subject compared to many science subjects. Hey, don't took it as sad face! That was the reason why I wrote "Bao Cing Tian" face in my post! Because there's so many people took it as sad face just like you. I don't want people felt sad because the sky was sad. I wanted people felt happy and interested when they saw smile face and "Bao Cing Tian" face! Please join our astronomy club then you will learn more about astronomical photography... Ha ha. It's not because I am the president of our club so I want you to join. It's because I really want you to learn about it! You have such talent on photography! Why not try it? I don't exactly konw waht you are saying-- "special phenomenona of the moon"--Do you mean you want to know about the lunar face?or...?